I read this article and found it very interesting, thought it might be something for you. The article is called Using Core Values to Enhance Organizational Performance and is located at https://teamperformanceus.com/2013/11/using-core-values-enhance-organizational-performance/. It’s important to have the organization’s core values down in writing regardless of business size. Why? According to 7Geese, core values are what support the vision, shape the culture, and reflect what the company finds important on a more personal level. In high performing organizations, the core values are often utilized in a variety of ways to enhance the performance of the company. 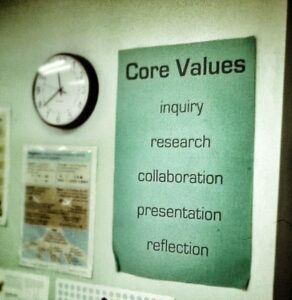 Core values are becoming more than just a way for a business to better identify what it stands for. Companies are now using their core values to attract and recruit the right type of employees that will flourish in their workplace and similarly; prospective employees are looking for businesses that have core values that closely match their own. Using the core values as the basis of decision can help employees with the choices they have to make as they undertake their daily work. For example, if a company has ethics as a core value and only offers products that are all-natural, a procurement manager would use the company core value of ethics as a standard to decide whether or not to carry a new product that is cheaper but contains artificial flavoring. This type of decision-making framework helps save time and allows employees to focus on products and projects that will be more valuable to the company over time. In organizations where the leaders and managers exemplify the core values, there is greater trust among all levels of employees. When employees see their manager and executives “walking the talk” they know that the core values really matter and they are more willing to trust and commit to the organization’s financial goals. The National Park Service uses their core values (shared stewardship, excellence, integrity, tradition, and respect) as a benchmark to teach and reward employees. They utilize their core values to set a guideline for how an employee should be recognized for their outstanding service as well as a baseline for continuing education in the workplace. Employees that are recognized for their work and feel valued are much more likely to be higher producers and stay with the company longer, reducing turnover. Contact us today to determine what actions you can take to align your company’s core values and increase your organizational performance.